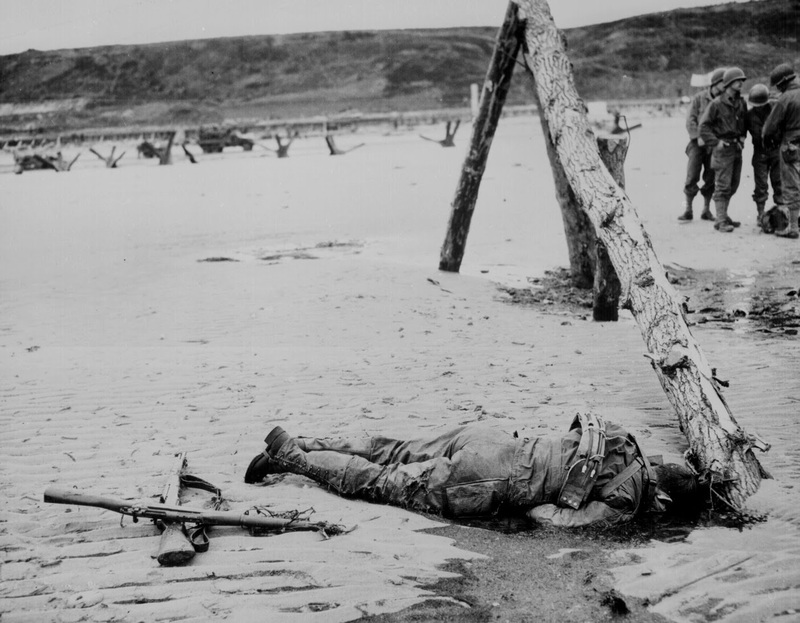 Crossed rifles on the sand are a comrade’s tribute to this American soldier who sprang ashore from a landing barge and died at the barricades of Western Europe. Picture taken a few days after D-Day, on Omaha Beach. It had to have been after the artillery was stopped. Those guys on the background aren’t standing around. They’re receiving orders or getting a briefing. Besides, they had stretcher-bearing details for recovering bodies. But why does it seem like more often than not dead soldiers end up face down? Soldiers tend to die as they’re moving forwards toward their objective. It’s not like in the movies. Providing the soldiers are killed instantly (head shot, shot to the heart, etc) they will drop instantly. No throes of agony and whatnot. Also a dead soldier face down is a faceless casualty of war, it’s awful but that is the cost of war. A dead soldier face up is someone’s kid/brother/husband, the expression on his face would haunt the public. It makes sense that they would censor those pictures. Omaha was the most heavily fortified beach, with high bluffs defended by funneled mortars, machine guns, and artillery, and the pre-landing aerial and naval bombardment of the bunkers proved to be ineffective. Difficulties in navigation caused the majority of landings to drift eastwards, missing their assigned sectors and the initial assault waves of tanks, infantry and engineers took heavy casualties. The result of the unsuccessful bombardment was a death trap for the American soldiers who moved onto the small piece of sand. Colonel George A. Taylor, who lead his troops against a German machine gun emplacement said: “Two kinds of people are staying on this beach, the dead and those who are about to die”. The fighting was brutal and more than 2,000 American lives were lost in the attempt to take Omaha beach. The crossed rifles are of different type the bottom rifel is am M-1 Garand and the top rifel is an O-3 A-3 probably 28 Infentry Div. A Pennsylvania National Guar. Unit. At this stage of the war these untits hadn't.t yet been equipped with the M-1 this picture is featured at the D-Day exhibit at the WW2 Museum in New Orlines. La.A veteran guide there gave the explination for the different rifles. The M-1 probably came from a different Unit. It looks more like an M1903 instead of the M1903A3. If you look closely you can see that the rear sight is a ladder type sight that's just forward of the receiver. The A3 had a peep sight mounted on the rear portion of the receiver.